What exactly is a chain anyway? My ancestor was a Chain surveyor in Early Texas. I recently found a court case in which his measurements were used. Fascinating stuff. Neat, Fran! I hope the case was interesting! In the UK distances along rail lines are still measured in miles and chains! Don’t know how much this measure is used anymore in the US. Not so much any more, Dave, but I did see the reference to this still being used along the UK rail lines. That’s fascinating. Today they measure in feet and inches, but in some rural areas there are still some large parcels that have remained in the same family for generations. The only time they’d go to the expense of obtaining a new survey would be when they got into a boundary dispute with the neighbors, or decided to subdivide. Otherwise they’d just pass it down from father to son by means of either a will, or a quit claim deed, using the description from the prior survey, which could easily date from before the Civil War and describe the boundaries in terms of links and chains. We discovered a whole bunch of civil engineers and surveyors on one branch of my mother’s family tree, going as far back as the 1780s. My uncle was one of them. So naturally, one of the exhibits that particularly interested him when we visited Gettysburg was a set of surveyors tools, including a set of chains. 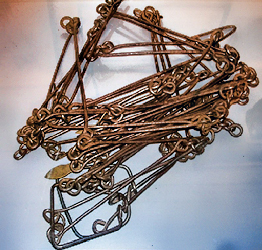 He explained that even if all of the iron links were absolutely perfectly-sized when made, the iron would expand or contract, depending upon the temperature, so the length of the chain would vary slightly from hour to hour and day to day. Not only that, but through usage, the links would also tend to loosen up a little, so over time the entire chain would tend to stretch. That is one reason the surveyors always used to try to refer to a permanent landmark to help identify the corners of the property for those who came after them. He had some stories to tell of finding blazes thirty feet up in the air on ancient trees, boulders that had turned turtle or slipped down the mountain (just like so many old gravestones) and concrete markers that had disappeared beneath layers of new topsoil. Similar problems affected the steel tape measures of the 20th Century surveyor. In addition, changes in the earth’s magnetic field sometimes shifted the compass headings slightly, and that could make the corner at the end of a 600 foot stretch appear to be somewhere other than where the markers showed it actually was when the previous surveyor was there 30 or 40 years earlier. So those landmarks remained important. My uncle was very excited by the new satellite technology available to today’s surveyors, but I’m guessing that as time goes on new glitches will be discovered with those tools as well, and the job of the surveyor will remain an art as well as a science. Another reader, Mary Douglass, shared the fact that some surveys in Kansas had to be completely redone because of the stretching of chains! Ok, it ain’t genealogy, but I think I’ve read that unless a survey was fraudulent or in gross error, the law accepts the surveyor’s result – peg in the ground, monument, etc. – as a true boundary, even if there are slight measurement errors. The theory, I think, is that you need finality or you would be re-surveying forever. There have been fraudulent surveys however. For example in Colorado where the contract surveyor accepted payment, but didn’t bother climbing up and down mountains. He merely constructed fanciful maps. Maryland land records include many wonderful records of Land Commissions wherein sundry persons made affidavits regarding boundaries’ markers. They include such things as 20 years previous the affiant was with his uncle, who pointed to a tree now removed by beavers, which was about 6 feet west of where this chestnut oak is now . . . . The affiants usually identify themselves by age and sometimes state who they were related to or an employer’s name. Sometimes they had themselves been chain-bearers for a tract. In other areas an annual (or nearly) “Processioning” was recorded whereby authorities walked the bounds of tracts, recording distances, markers, owners and adjacents. Chuckles may also be found in deeds separated by time, where the first acquisition was described by stones, hills and trees, and one 20 years later refers to a dogwood where there was formerly a walnut, fallen trees and numerous ~stumps~. Researchers who ignore land records deny themselves joy and treasure. Here’s a tip for blog readers with an adventurous ancestor who appears to have arrived in one of Georgia’s frontier areas in the months before land was distributed through one of the eight Georgia land lotteries (held in 1805, 1807, 1820, 1821, 1827, 1832 (2 lotteries), and 1833). There’s a simple way to determine if your ancestor might have been part of one of the district survey crews who created the original District Plats of Survey for Georgia’s land lotteries. You can usually find the names of the surveyors and their crew (chain carriers, axemen, etc.) listed at the beginning of the District Survey Field Notebooks, which are digitized and available online at the Georgia Archives’ Virtual Vault. Even in the (relatively few) instances when a district surveyor did not list the names of his chain carriers in his field notebook, these names are almost always included in the metadata created by the staff archivists. This information appears under the heading “Object Data” below each digitized page of a field notebook. Since the metadata is included in the searchable index for this collection, you don’t need to manually read through the metadata for all of the individual notebooks. Just fill in your ancestor’s name in the search box at the top of the District Survey Field Notebooks landing page and click on the search button. One more point from this side of the Atlantic, although completely irrelevant to genealogical research: cricket pitches are 22 yards, or one chain, long. Now that is something that would never have occurred to me, Graham! Thanks!